Veal meat has been the center of the plate for European cuisines for centuries. While our European ancestors brought their family recipes with them to America, the practice of raising veal in the United States didn’t fully develop until the 1900s. A lot has changed since then, and today, people are rediscovering veal as a sustainable and humanely-raised meat choice. You might say people are rekindling an old love. 1.) Contact your local retailer and order veal through the meat department. Be sure to request American veal. 2.) If your local retailer is unable to help, contact one of our AVA-member companies such as Catelli Brothers and Marcho Farms to order direct. 3.) Of course, you can enjoy veal at a restaurant, but then you miss the joy of cooking it yourself! Not everyone has a 200-year old family cookbook to reference for veal recipes, so follow this link to discover new recipes for enjoying veal. To learn more about how veal is raised today, visit a few farms by watching this video. Proposition 12 in California is an unnecessary overreach given how milk-fed veal is raised today. The American Veal Association believes consumers deserve food that is produced in an ethical manner that aligns with their values and expectations. The most significant demonstration of this commitment was in 2017 when AVA member farms achieved a goal set in 2007 to completely transition to raising all calves in group housing. The change also includes the elimination of tethers. AVA estimates more than $150 million was invested in new buildings and renovations over the past 10 years. These new facilities enable the Five Freedoms of Animal Welfare, which are the international standard for assessing expression of normal behavior in animals, to be practiced. AVA members are fully committed to providing consumers with safe, nutritious meat that comes from animals humanely raised. Unnecessary regulations based on misleading and out-of-date information will not improve animal welfare or food choices for consumers. We encourage California voters to vote NO on Proposition 12. Additionally, the association reports castration, dehorning, tail docking or tethers are not practiced on AVA member farms. Today, there are a variety of different facilities to house veal calves in groups ranging from as few as two up to groups of ten or more. These facilities allow for the Five Freedoms of Animal Welfare, which is the international standard for assessing expression of normal behavior in animals. 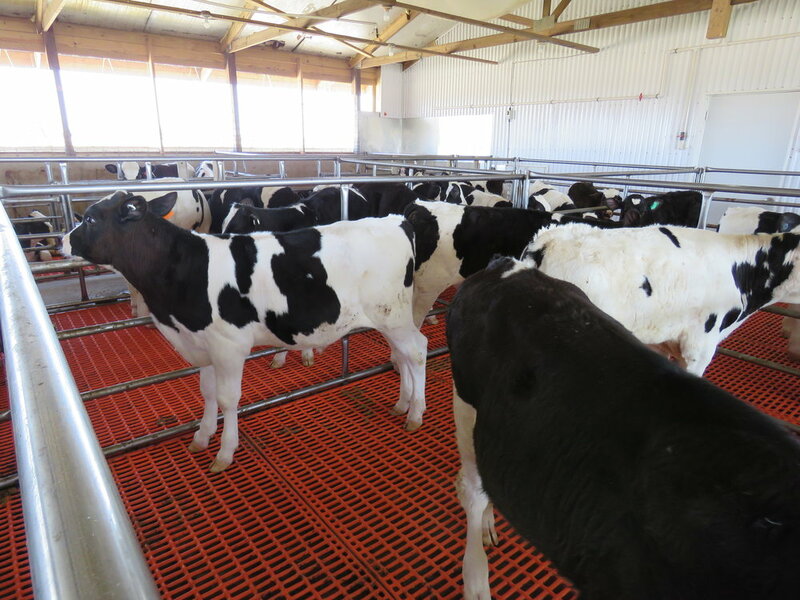 Adequate pen space is provided for each calf to easily stand, stretch, lie down, turn around, groom naturally, and have contact with other calves. Calves are in group pens of two or more calves, and no calf is individually penned after 10 weeks of age, unless it is for health reasons such as sickness, injury or disease. Calves are handled in a calm, controlled and gentle manner. Animal caretakers are trained to handle calves with minimum stress to the animal and the consequences of inhumane handling are known and enforced. Facilities are ventilated and protocols are in place to minimize airborne particles to reduce odors, dust and/or noxious gases. All classes of calves are provided with reasonable protection from heat and cold. Facilities provide ample natural and/or overhead lighting. Pens are routinely cleaned and the resting area provides warmth, dryness and traction at all times. Other changes in the milk-fed veal industry during this period include feeding some grain and roughage to the calves, in addition to the nutritionally-balanced milk formula, and marketing the animals at an older age resulting in larger calves of 475 to 500 pounds. Some AVA members also practice pasture-raised veal which provides another product offering for customers. 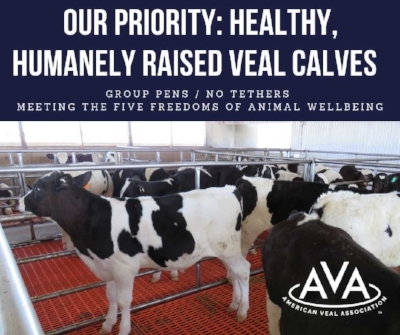 The AVA’s dedication to transition to group pens confirms the U.S. milk-fed industry is committed to the well-being of their calves and supporting a culture of continuous improvement to ensure positive change for animal care. These new facilities allow calves to stand, stretch, lie down, groom themselves and socialize with other animals. 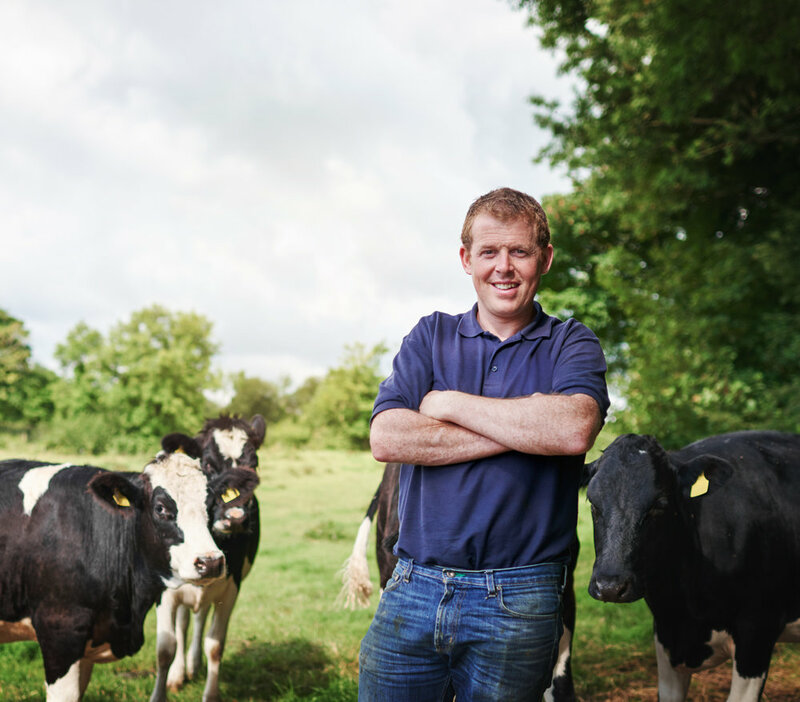 Learn more about the new American Veal Association and the benefits of purchasing and serving American veal, humanely-raised by local family farmers. Download the brochure. The American Veal Association (AVA) is extremely disappointed in an apparent decision by USDA's Food Safety and Inspection Service (FSIS) to allow imports of veal from the Netherlands into the United States. The AVA is concerned the agency has failed to fully assess the Netherlands' inspection and production system for veal in making its determination that the Dutch system is equivalent to the U.S. system. The AVA believes the proposed rule is unnecessary and misleading. The AVA supports the current regulation which allows calves that are tired and cold a period of time to rest upon arrival at the slaughter plant. Similar to other young animals, veal calves need to rest frequently. They are also very sensitive to heat and cold, and are subject to transit fatigue. Formula-fed veal is typically shipped from climate controlled barns, unlike large bovines that are often coming from outdoor feed yards. Veal calves have not been conditioned to the weather extremes that older bovines have, making them more susceptible to exposure during transport. The thermo-neutral zone for young calves is much narrower than for older bovines. However, veal calves typically have a quick recovery when given an opportunity to rest and be rehydrated. The same is true for pigs. The U.S. veal industry recognizes that consumers and customers expect us to produce food in a responsible manner consistent with their values. To foster more confidence in our practices and promote a better understanding of our guiding principles, we affirm the following ethical standards and code of conduct for those involved in the U.S. veal industry.